This press has all the features of the award-winning Turret Press with quality touches that make this the finest, most convenient press to own. The Classic Turret features the solid steel linkage of the Lee Classic Cast. Your first stroke of the hardwood gripped lever will convince you this is one, solid silky smooth press! The sturdy iron base shows its Classic Cast roots. The long stroke allows rifle cases over three inches long to be loaded using the automatic index. Deactivate the Auto-Index and cases over 4 inches can be loaded. The rigid cast iron frame supports the ram with over 12 square inches of area. The industry’s largest ram is drilled completely through to dispense primers in an attached clear PVC tube. Every primer is caught–guaranteed. Instant change turrets are the same as the famous Lee Turret Press. The Classic Turret uses the new Lee Lever Primer System (LPS) and the Lee Safety Prime tool makes priming on the press a delight. If you like to own the best, then treat yourself to the Lee Classic Turret. The finest reloading system made. Pictured: 4 Hole Classic Turret Press is mounted to our Bench Plate, this is not included with the press and needs to be purchased separately. The “O” frame press by design is the strongest and by far the most popular style press. The larger than average opening allows for maximum hand clearance. The spent primer catcher is positive and allows you to route the spent primers directly to the trash can. Priming is a dream with the Lee Lever Prime System. Best of all, it includes the Breech Lock Quick Change die system. Change dies instantly with a twist of the wrist, and you never have to re-adjust your die. 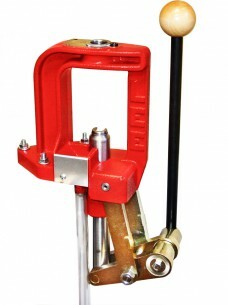 Other features include all steel linkage with adjustable length lever. This same press costs you over twice as much from other manufacturers, and that’s without all of the Challenger’s features. Press includes one Breech Lock quick change bushing. 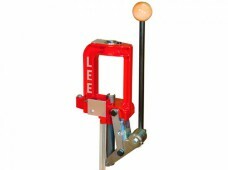 The Lee 3 Hole Turret Press is a proven spring-free design with compound leverage. The turret is locked into a solid steel ring with big rifle bolt type lugs. Patented design puts the lugs on the circumference to prevent tipping. The linkage is so powerful that the largest magnum cases are sized with little effort. Features built-in primer catcher, long stroke, generous hand clearance and a comfortable wood grip. Purchase extra turrets and never remove the dies. Simply lift out the entire turret and replace with the next caliber. Dies, shellholders and primer arm can be changed in seconds without tools. Proven design with compound leverage. No spring in this turret design. The turret is locked into a solid steel ring with big rifle bolt type lugs. Patented design puts the lugs on the circumference so there can be no tipping. The linkage is so powerful that the largest magnum cases are sized with ease. Effort required is so small that the usual heavy bench is not essential. The Lee Turret Press has built-in primer catcher, longer stroke, more hand clearance and a comfortable new foam grip. Even if you do not need all of these features, why pay more for anything less? In fact, you will want a Lee Turret Press even if you already own a more expensive one. The forth hole in the turret allows you to install your Lee Factory Crimp Die or taper crimp die in the press. The auto index on the press is capable of loading cartridges with an overall length of 2.313″ or less. 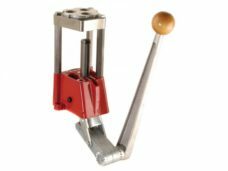 Our Classic Turret Press also has the auto index feature, and is capable of loading cartridges with an overall length of 3.313″ or less. For both presses, anything longer than the above specs, would require the turret to be manually advanced. Note: If you are using the Auto-Disk Powder Measure on this press, the Auto Disk Riser will need to be purchased to provide adequate clearance for the Lee Safety Prime. 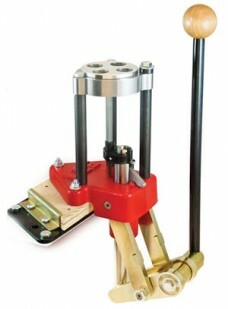 Product image note: The 4 Hole Turret Press is pictured mounted on the Lee Reloading Stand. This item is sold separately, # 90688. This kit features the same components as the 50th Anniversary Kit, but we have replaced the Safety Prime with the Auto-Prime XR and a set of Auto-Prime Shell Holders. This kit is for those who prefer to prime off the press. Includes the new Breech Lock Challenger Press and one Breech Lock quick-change bushing. You get a complete powder handling system, with the most convenient and repeatable Perfect Powder Measure. Plus the Lee Safety Scale, the most sensitive and safest of all powder scales and fill your case with the included Powder Funnel. A $175.43 value. Case Preparation Tools include a Value Trim Case Trimmer that allows you to trim directly on your reloading press (order cartirdge specific trim die separately) and a cutter and lock stud to trim your cases by hand. Order the correct case length gauge for the calibers you will be loading, it’s only $5.50 extra. An included chamfer tool chamfers the inside and outside of the case mouth and a tube of premium sizing lube is included. A small and large primer pocket-cleaning tool completes the case preparation package. $17.92 value. Purchased separately, it’s a $255.29 value! The Lee Classic Cast Breech Lock Single Stage Press is the press that Lee Customers have been asking for. It takes the proven design of the Class Cast press and adds the Breech Lock feature giving reloaders the convenience of quick-change die bushings. Press features a rigid, cast iron “O” frame with an attractive baked powder finish, large opening and 4″ ram stroke. The powerful steel compound linkage with travel stop helps to prevent “cam-over”. and the automatic primer arm, primes at the bottom of the stroke The large 1-1/8″ diameter ram ensures there is minimal flex and includes large and small primer cups. Accepts both standard 7/8″-14 threaded dies in the breech lock die bushings. Adjustable for right or left hand use. This kit and a set of Lee dies is everything you need to begin reloading. The Classic turret press is fast and convenient when loading handgun cartridges, with rates in excess of 250 rounds per hour possible. The kit includes the Pro Auto-Disk powder measure and riser, perfect for all handgun and small rifle cartridges. Large and Small Safety Prime are included making on press priming an ease. Instant change turret makes changing calibers a snap. Deactivate the auto-index and batch load the longest and largest rifle cartridges. 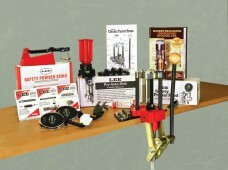 Lee Load-Master progressive 5-hole reloading kit for 9mm Luger. Includes carbide 3 die set (full length size, powder through expanding and bullet seating dies), turret, shell plate powder measure, case feeder and primer feed. WARNING: Only CCI or Remington brand primers are safe use with this press. If you plan on using any brand besdies CCI and Remington, you must purchase the explosion shield. Manufactured to help make bullet case reloading a quick and fun process, the Lee 90637 Cast Iron Pro 1000 Reloading Kit For 357 Magnum is an excellent method for saving money. Built using unbelievably robust supplies, these Reloading Presses and Press Accessories through the professional reloaders at Lee offer you many years of efficient use. For a long time, Lee has elevated the bullet reloading business, and the Lee 90637 Cast Iron Pro 1000 Reloading Kit For 357 Magnum is the direct outcome of the time and commitment they take to improving their profession and making it possible to reload your bullets with ease. Our principal target here at OpticsPlanet is always to ensure you have access to the best reloading tools available, and the Lee 90637 Cast Iron Pro 1000 Reloading Kit For 357 Magnum is an item that we’re stoked to have the ability to present. For an effective way to ensure that that you are reloading with the best resources that the trade can offer, choose the Lee 90637 Cast Iron Pro 1000 Reloading Kit For 357 Magnum. Lee 90637 Cast Iron Pro 1000 Reloading Kit For 357 Magnum – Add a bullet and pull the lever; all other operations are automatic. One loaded cartridge with each pull of the lever. Every operation is automatic. Primers, like the powder, are fed only if a case is present. No wasted primers or spilled powder. Alternate loading sequence lets you load only one case at a time. Lee’s Pro 1000 makes learning easy for the first time user and great for fine adjustments or experimenting. Designed to make bullet case reloading a fast and enjoyable procedure, the Lee 90643 Cast Iron Pro 1000 Reloading Kit For 45 Colt is an excellent way to save income. Produced by using incredibly robust materials, these Reloading Presses and Press Accessories through the expert reloaders at Lee offer you years of efficient serivce. For a very long time, Lee has been in the bullet reloading business, and the Lee 90643 Cast Iron Pro 1000 Reloading Kit For 45 Colt is the direct outcome of the time and dedication they take to mastering their profession and helping you to reload your bullets without difficulty. Our main target here at OpticsPlanet is always to make certain you get the best reloading instruments out there, and the Lee 90643 Cast Iron Pro 1000 Reloading Kit For 45 Colt is an item that we are delighted to have the ability to provide you with. For an excellent way to make certain that you are reloading with the best tools that the industry provides, choose the Lee 90643 Cast Iron Pro 1000 Reloading Kit For 45 Colt. Lee 90643 Cast Iron Pro 1000 Reloading Kit For 45 Colt – Add a bullet and pull the lever; all other operations are automatic. One loaded cartridge with each pull of the lever. Every operation is automatic. Primers, like the powder, are fed only if a case is present. No wasted primers or spilled powder. Alternate loading sequence lets you load only one case at a time. Lee’s Pro 1000 makes learning easy for the first time user and great for fine adjustments or experimenting. Designed to help make bullet case reloading a rapid and fun process, the Lee 90635 Cast Iron Pro 1000 Reloading Kit For 44 Magnum is an excellent way to save income. These Reloading Presses and Press Accessories from Lee are made with the long lasting and efficient components that you’ve come to anticipate from this remarkable company. 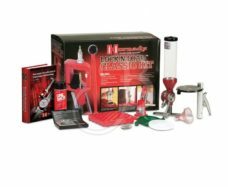 Lee has been in the bullet reloading niche for a very long time, and the Lee 90635 Cast Iron Pro 1000 Reloading Kit For 44 Magnum is evidence of their resolve for helping you make reloading an exciting and speedy procedure. Our major focus here at OpticsPlanet is always to make sure that you get the very best reloading resources accessible, and the Lee 90635 Cast Iron Pro 1000 Reloading Kit For 44 Magnum is undoubtedly an item that we are thrilled to have the ability to provide. If you are looking for a great approach to be sure that you are reloading with the best possible equipment, pick out the Lee 90635 Cast Iron Pro 1000 Reloading Kit For 44 Magnum. Lee 90635 Cast Iron Pro 1000 Reloading Kit For 44 Magnum – Add a bullet and pull the lever; all other operations are automatic. One loaded cartridge with each pull of the lever. Every operation is automatic. Primers, like the powder, are fed only if a case is present. No wasted primers or spilled powder. Alternate loading sequence lets you load only one case at a time. Lee’s Pro 1000 makes learning easy for the first time user and great for fine adjustments or experimenting. The Lee 90640 Cast Iron Pro 1000 Reloading Kit For 9MM Luger has been developed to be the perfect method for saving income by reloading your own used or spent bullet cartridge casings. 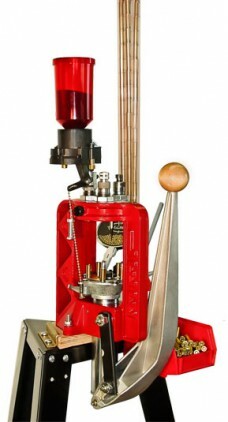 Made implementing incredibly durable materials, these Reloading Presses and Press Accessories through the experienced bullet reloaders at Lee will provide you with numerous years of efficient use. 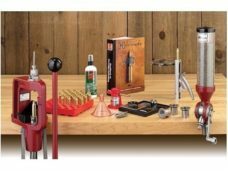 Lee has elevated the bullet reloading community for many years, and the Lee 90640 Cast Iron Pro 1000 Reloading Kit For 9MM Luger is evidence of their resolve for helping you make reloading an exciting and speedy procedure. Our major target right here at OpticsPlanet is always to ensure you get the best reloading resources available, and the Lee 90640 Cast Iron Pro 1000 Reloading Kit For 9MM Luger is an item that we’re delighted to be able to offer. If you are looking for a fantastic approach to ensure that you are reloading with the most beneficial equipment, select the Lee 90640 Cast Iron Pro 1000 Reloading Kit For 9MM Luger. Lee 90640 Cast Iron Pro 1000 Reloading Kit For 9MM Luger – Add a bullet and pull the lever; all other operations are automatic. One loaded cartridge with each pull of the lever. Every operation is automatic. Primers, like the powder, are fed only if a case is present. No wasted primers or spilled powder. Alternate loading sequence lets you load only one case at a time. Lee’s Pro 1000 makes learning easy for the first time user and great for fine adjustments or experimenting. 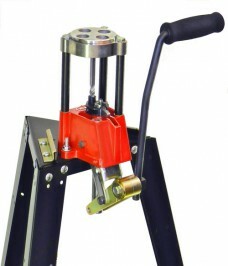 This is the perfect press for the reloader looking to try their hand at reloading without spending a lot for a press. This outstanding value has many features such as the exclusive balanced lever that wont drop down to pinch fingers, unlimited hand clearance only a C-Frame can offer and is built to last. Many reloaders find this press to be such a great value they will buy a couple just so they don’t have to change out dies. The Lee 90682 Cast Iron Pro 1000 Reloading Kit For 40 S&a was developed to be the most suitable strategy for saving income by reloading your own spent bullet cartridge casings. Produced making use of unbelievably durable components, these Reloading Presses and Press Accessories through the expert bullet reloaders at Lee will provide you with numerous years of efficient serivce. 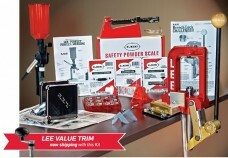 Lee has been in the bullet reloading community for very many years, and the Lee 90682 Cast Iron Pro 1000 Reloading Kit For 40 S&a is verification of their commitment to helping you make reloading an enjoyable and speedy procedure. Our major focus here at OpticsPlanet is always to make certain you have the very best reloading equipment available, and the Lee 90682 Cast Iron Pro 1000 Reloading Kit For 40 S&a is an item that we’re thrilled to have the capacity to present. If you are looking for a fantastic approach to ensure that you are reloading using the most beneficial gear, go for the Lee 90682 Cast Iron Pro 1000 Reloading Kit For 40 S&a. Lee 90682 Cast Iron Pro 1000 Reloading Kit For 40 S&amp;a – Add a bullet and pull the lever; all other operations are automatic. One loaded cartridge with each pull of the lever. Every operation is automatic. Primers, like the powder, are fed only if a case is present. No wasted primers or spilled powder. Alternate loading sequence lets you load only one case at a time. Lee’s Pro 1000 makes learning easy for the first time user and great for fine adjustments or experimenting.